If you have a new office space, and planning to invest in some classy furniture, then you should start with a good reception desk. A decent reception desk is very important because it should be compatible with the look of your office, and also be comfortable to use and feasible for the visitors for paperwork and other purposes. A L-shaped reception desk could very well be an ideal choice because it makes the space look bigger and more airy, without taking away working area. Moreover, it gives you a lot of space to organize and manage your things as it has many drawers and shelves. There are different types of reception desks that you can choose from according to your requirement. Basically, what you choose for your office depends on several factors like what type of business it will be used for as in the main function or purpose of the desk, the space and layout in the room/are, and the style and decor of the other furnitures. 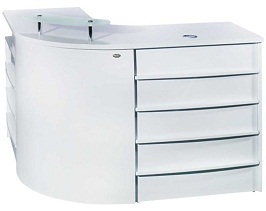 Keeping all this in regard, L-shaped reception desks are the most feasible ones for your office. They give enough space in terms of drawers and shelves, yet they do not take a lot of the room space. They provide a compact space, where a receptionist can do her work comfortably, and visitors can also fill up paperwork etc. if required, without any hassle. The L-shaped reception desks have enough space to hold different devices like printer, fax machine, etc., and give you your own space to work. If you already have a reception desk, which is straight, you can easily purchase the additional part, often known as the ‘reception return’ and attach it to your existing desk t make it L-shaped. 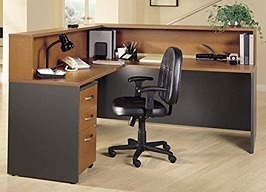 There are hardly any disadvantages other than it is costlier than a normal straight desk. And, sometimes, when it is placed in a corner, it loses the dead space behind the monitor. 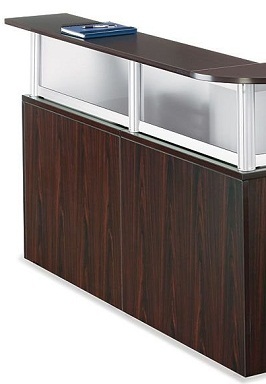 A L-shaped reception desk is the right piece of funiture depending on what type of business you run. These can be easily customized and made appropriate for use in offices, as salon counters or spa counters, etc. Modern receptions desks gives a modern look to your office as well. Might not be compatible with all kinds of office decor. 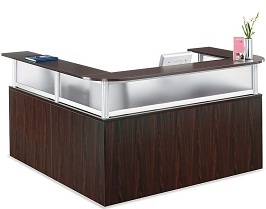 Generally, L-shaped reception desks are around 60-72 inches, but can go up to 92 inches as per requirement. If you have a space constraint or you need a corner reception, then a small L-shaped reception desk is a feasible option. They have compact designs, which takes less of floor space, but gives the user enough room to work and manage things. 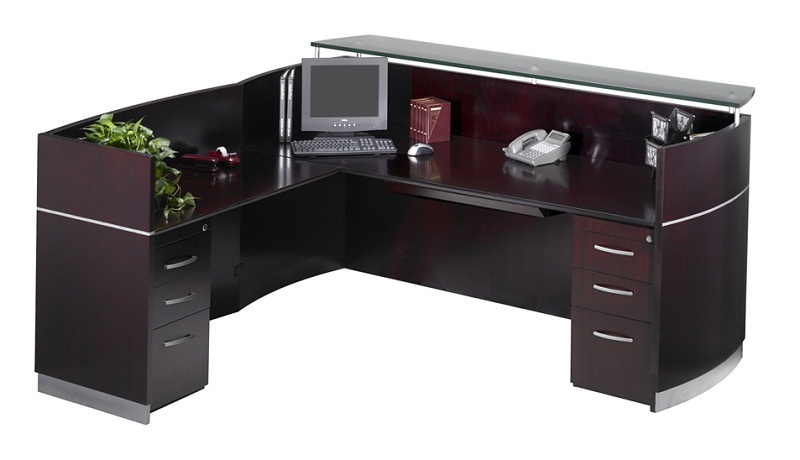 This product gives an impressive look to your office. It includes the L-shaped reception with a mobile pedestal. 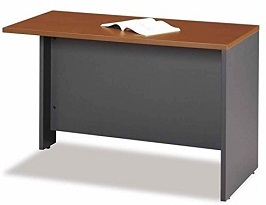 The desk return has enough walkup space for the guests and can be placed on either side as per convenience. The levelling guides take care of uneven flooring. The mobile pedestal fits below the desk and comes with swivelling castors for mobility. It has one hanging file drawer along with two smaller utility drawers. The mocha laminate gives a rich look. Users have given it high ratings, and they are satisfied with the look and feel of the product. They are also of the opinion that it is also easy to assemble the product. This one from Sandia is a good buy for nail salons. The white colour with the rounded stylish look is perfect for using at a salon and easy to use with all its accessories. Users are not too happy with the product, hence they have given mixed reviews. Many feel that the product dimensions are misleading, and the quality has been compromised. 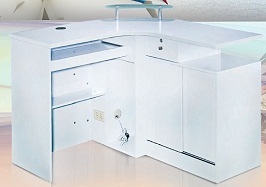 This is a large desk with a lot of dedicated storage space like drawers, a closed cabinet for CPU, etc. There are grommets on the desktop for cable access. The file drawers have full-extension slides and there is a space for everything. The drop-front drawer/keyboard tray can be fitted either on the left or the right. The wind oak finish gives a nice look. Very sturdy to use and has a lot of storage options. The look is nice and elegant. Users have given a mixed rating. 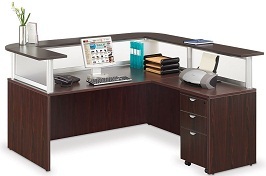 They like the look and feel of the desk, which has a lot of dedicated storage also. However, it is a tedious task to assemble the same, but it is sturdy to use. Many have faced problems with the drawers and feel it is not value for money. 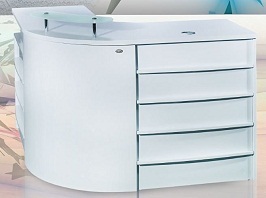 This is a stylish reception desk with a lot of flexibility and storage. The high quality thermally fused laminate is anti-resistant to scratches and stains, hence increasing the durability. The return bridge can be mounted on either side of the L-shaped work area. There are lots of drawers and pedestals can also be attached. Users have liked the product because there is a lot of storage and customizations that can be done. They have appreciated the stability and ease of assembly. 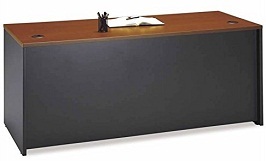 Based on the above product reviews, you can choose the right L-shaped reception desk for your office. Choose according to the utility, durability, and available space. A pure black colour might be a good choice to hide scratches and stains. With a glossy or matt finish laminate, it will surely give a stylish look to your office space. You can also add a white glass element to make it look attractive. The decision is yours to make and this article has attempted to make it easier for you to come to a conclusion.